Customer Spotlight Feature - Dino Rentos Studios, INC.
Phillip Ramsey, Sales & Marketing Manager at Osteoremedies, LLC reached out to manufacture a 3D enlarged replica of their new Remedy Hip Spacer System. Their vision is to be the premier choice for surgeons by providing simple solutions to complex disorders focused on revision and infection remedies.The Hip Spacer was being displayed at the 2019 AAOS Expo in Las Vegas. A 3D CAD model was provided for production. The unit was produced at 6 FT Tall. Our team CNC Routed the piece in EPS Foam. It was PolyUrea Coated, and Painted. Pin Uplights were installed, giving it the perfect finishing touch. Judy Acosta of Miami Seaquarium, out of Miami, FL contacted our team of professionals to produce an outdoor prop for their Tastes of Miami annual event. The Miami Seaquarium is a 38-acre oceanarium that houses sea life of all kinds. They attract over 500,000 people annually. Each year they host the Tastes of Miami. Judy contacted our team for assistance with creating an awesome photo op for their attendees. This Print on Foam Logo was carved in EPS Foam, polyurea coated for durability, painted in a vibrant color, and was applied a pvc full-colored graphic for branding. "We wanted to give our guests a unique photo opportunity. Dino Rentos Prop Studios and with Jennifer's patience, we accomplished a beautiful oversized prop of our event logo. It was a hit with our guests. Kathryn Crimani of ADM Productions contacted our Sales Team in search of a vendor to produce her client's logo for the Commit 2019 Shaw Flooring Network Tradeshow. ADM Productions is an Event Management company based out of Port Washington, NY that provides clients worldwide with live multimedia productions. The unit was CNC Carved in EPS Foam using a digital cut file. The logo was then coated in a PolyUrea Plastic Coating to provide a smooth finish. ADM Productions provided custom colors to add the perfect branding touch. Once the logo arrived to the tradeshow, an onsite artist added a beautiful collage of business cards. Claudia Hon of Precussionaire Corporation was such a pleasure to work with! Precussionaire Corporation is one of the country's leaders in Lung Conditioning Therapy. The team contacted us to manufacture an enlarged replica of their new Phasitron, also known as the P5. The unit was being exhibited at the AARC Congress 2018 in Las Vegas, NV. Claudia and her team provided a 3D model that was used for production. The unit was 3D Printed in PLA Plastic and sanded smooth by our team of artists. The P5 was finished with a clean and crisp paint job and vinyl labeling, adding the perfect finishing touch to their unit. "The oversized model helped our customers and clinicians easily visualize the new design. It made the product memorable and made it stand out in the show. The communication and response time by your company made the whole experience great!" Tom Kaps of Flock Free reached out to our Sales Team and to help produce some eye catching props to add to their Pestworld 2018 Tradeshow Display in Orlando, FL. Flock Free Bird Control Solutions is a family-oriented and operated business dedicated to the safe removal of birds, mosquitoes, and rodents from property. Custom Foam Pop-Out Tables with acrylic tops served as tables to hold literature and meet with attendees. The 3D Cardboard Letters "FLOCK FREE" added an awesome WOW effect. The letters stood 6 FT Tall and 16 Inches Deep. Each 3D Cardboard letter was hand pressed, cut, and assembled by our produciton team. The Print on Foam Logo stood 6 feet tall and was an awesome centerpiece to the letters. The custom pieces were the perfect addition to the Tradeshow Booth Display and we were happy to help! "Your team was easy to work with. People loved the booth. Thanks!" Brian Sentif of Moskatels contacted out team in search of a UFO Prop for their Halloween Themed Retail Display. Moskatels is a division of Michaels Stores, the largest American arts & crafts retail chain. 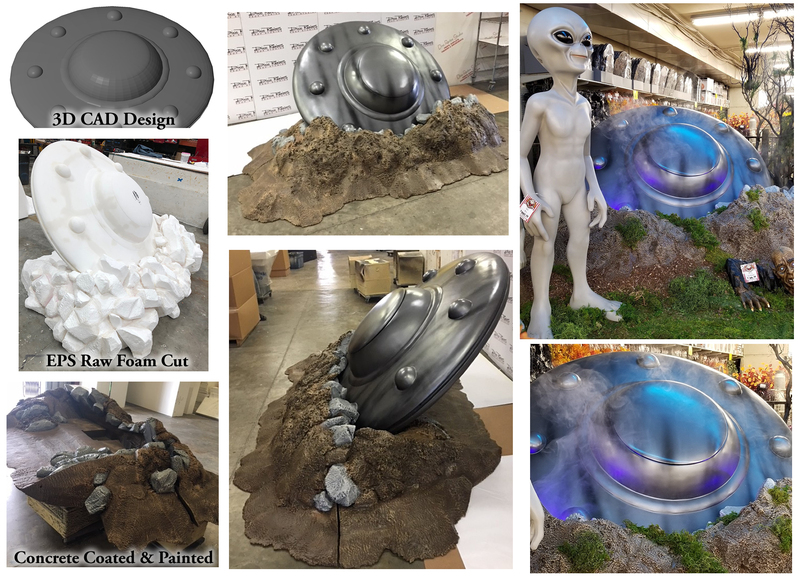 Brian and his colleague, Katie, worked closely with our design team to give the UFO and Rocks the perfect touch. Our team started with a 3D CAD File that was CNC Routed in EPS Foam. The unit stood over 6 feet tall. The rocks were sprayed in a concrete coated to give a realistic look and feel. The UFO was coated in Polyurea Plastic. The unit was finalized with an awesome paint job by our artist. The completed unit was displayed in Moskatels located in Los Angeles, CA! "Awesome job Dino Rentos Prop Studios! We were kept in the loop through the whole process. Chris gave us progress photos along the way and we watched our creation come to life!" Justin Morin of Atlas Oil reached out to our team with the vision of bringing their mascots to life. Atlas Oil is one of the largest fuel distributors in the country. Our team was honored to collaborate with them on this project. Justin and his team provided us with 2D renderings of their mascots. Our design team created 3D Digital Models that we CNC routed in EPS Foam. Our team finished with hand carving the final details. The characters were then Polyurea Plastic Coated for durability and longevity. Finally, a custom airbrushed paint job was done to bring the characters to life! Each unit was manufactured at 3.5 FT Tall and attached to a Painted Plywood Base. We were excited about the final product and even more thrilled that Justin and his team loved it! "We wanted to bring our two mascots, Sammy and Connecto, to life and found that working with Dino Rentos was as easy as working with one of our internal teams. The Dino Rentos team kept to the project timeline and collaborated with us on designs and color selections. The end result surpassed all of our expectations and are now proudly on display at our corporate office and satellite companies!" This 7 FT Tall Custom Foam Cheeseburger was requested by Heidi of Pebble Drive In. 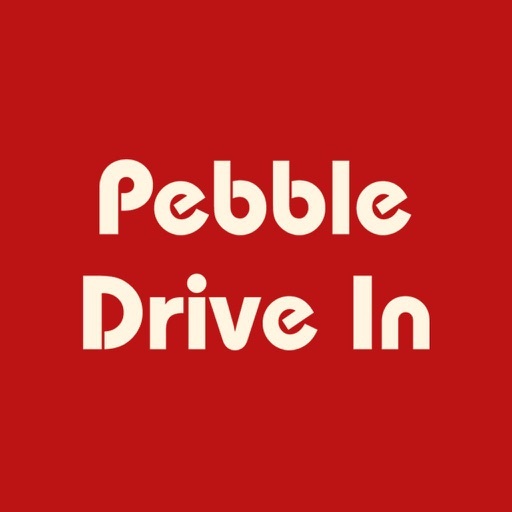 Pebble Drive In is based out of Herreid, SD. They are a family owned business that prides themselves on providing the freshest ingredients that keeps their customers coming back for more. Heidi contacted us with a clear vision of what she needed. She provided us with photographs of their cheeseburger and needed an enlargement to capture the attention of all who passed by. Our team of artist created a clay model that was laser scanned and then cut in EPS Foam. The unit was plastic coated with Polyurea Coating, spray painted and air brushed to provide realistic detail, and finished with a gloss coating. Steel was embedded to allow easy installment to their existing sign. John Cullen of Bulldog Marketing & Sales, Inc.
We had the pleasure of working with John Cullen of Bulldog Marketing & Sales, Inc. on an awesome product enlargement project. Bulldog Marketing & Sales, Inc. works with start-ups, entrepreneurs, and smaller organizations to allow access to top level pet marketing talent. John worked closely with our team to perfect these large 4 FT Foam Dog Toy Replica Props. The props were displayed at the Orange County Convention Center for a Toy Tradeshow. 3D CAD files were provided. Each unit was sculpted in EPS Foam, Painted, and vinly graphics applied for the perfect branding finish. My Favorite Company, Inc reached out to us in need of Custom Foam Lolli-Poop Lollipop Characters. This was their first embarking in the foam world, and we are so happy they selected DR Prop Studios for the job! Our Customer Service and Production team worked very closely with them to ensure they were involved throughout the entire process. These Custom Foam Lolli-Poop Characters ranged in height from 4-5 FT. Sample Lolli-poop Lollipop Candies were provided for laser scanning. Each unit was sculpted in EPS Foam and hard coated for durability. PMS colors were selected for painting to give the pieces the perfect vibrant finish. "The Lolli-Poops looked great! Attendees lined up all day during the show to take selfies. It was a big hit. ​​​​​​"
The Jackie Robinson Foundation is a returning client who recently contacted DR Prop Studios for custom foam numbers. The Jackie Robinson Foundation is a national Non-for-Profit organization that focuses on addressing the achievement gap in higher education. We manufactured 6 FT Tall Foam Painted Numbers "42". The Jackie Robinson Foundation selected their desired font style and paint color. The Foam Numbers were displayed at both their Pop Up Conference Store and Annual Awards Dinner.